Last year, Tate Britain held an exhibition on Queer British Art: 1862-1967 while Taipei’s Museum of Contemporary Art (MOCA) held an exhibition entitled Spectrosynthesis, the first LGBTQ art exhibition at a major art museum in Asia. 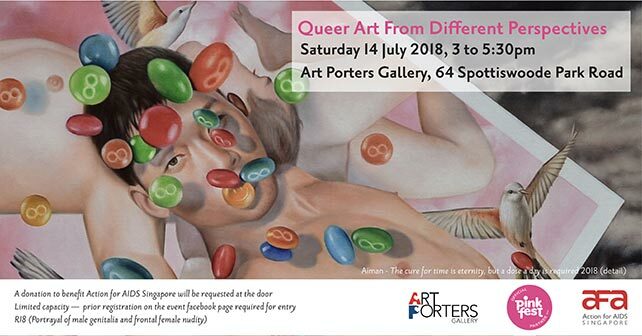 These groundbreaking exhibitions at such esteemed art institutions led Art Porters Gallery to introduce this topic in a local context: we’re hosting a talk in collaboration with Pink Dot SG. The talk will showcase four different and interconnected perspectives from the art ecosystem: that of the art historian, the artists and the collector exploring contemporary art as an testament to identity, struggle, action, passion and discourse. Expect an illuminating, comprehensive discussion which may leave you with as many questions as answers – but isn’t that what conversation and dialogue is all about?